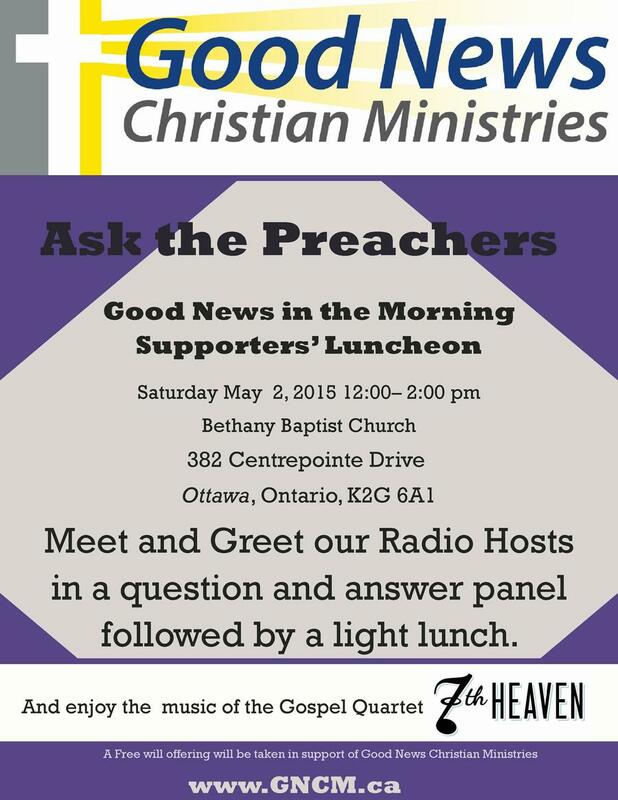 Our Spring 2015 event was designed to give our listeners the opportunity to mingle with our preachers, ask them theological and other questions and get to know them. It took place at Bethany Baptist Church from noon to 2 pm on Saturday 2 May 2015. This was a lunchtime event for your convenience, and indeed, there was a sit-down hot lunch. There was also a freewill offering to support the costs of our broadcasts every Sunday morning on 580 CFRA at 6:30 am - and then available by podcast. If you have friends who are not yet listeners to the program, you were invited to bring them along to this joyous occasion! Did you know that Brian Wilkie, one of our four preachers is also an accomplished acapella singer? One of the groups he sings with is 7th Heaven, and they sang for us on this day. See photos and a brief video of 7th Heaven here.